With a natural spreading habit Acer palmatum Omure yama is a very graceful plant. In its early stages it tends to shoot straight up. As it matures it develops a pendulous habit and forms an attractive specimen with an almost weeping look to it. 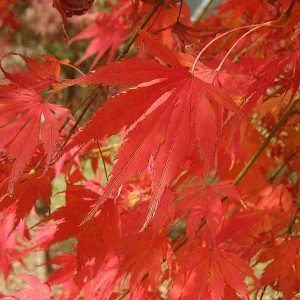 It is perhaps one of the best Japanese Maples for bright red autumn colour. Growth and height will depend on wether this central leader forms. Many gardeners like to stake the plant to encourage the initial height. Foliage is a good mid green with deeply lobed leaves. Autumn tones are a brilliant golden orange to red. Acer palmatum Omure yama with a good central leader will reach around 4 – 5 metres in height over time. It will form a broad spreading weeping crown of 4 – 5 metres. Like all Japanese Maples, ‘Omure yama’ doe prefer a humus rich well drained soil. It will grow well in full sun once established, however some protection from hot afternoon sun in warmer climates is beneficial. Prepare the planting hole well by digging in well rotted compost a few weeks before planting. Drive a strong support stake into the hole. Remove the maple from its container trying not to disturb the root system. Attach the stem to the stake at at least two points. Firm the soil in well, creating a saucer around the plant that will help with initial watering. Mulch around the plant with an open mulch. Apply some slow release general purpose fertiliser early in spring each year. Water well before and after fertilising.